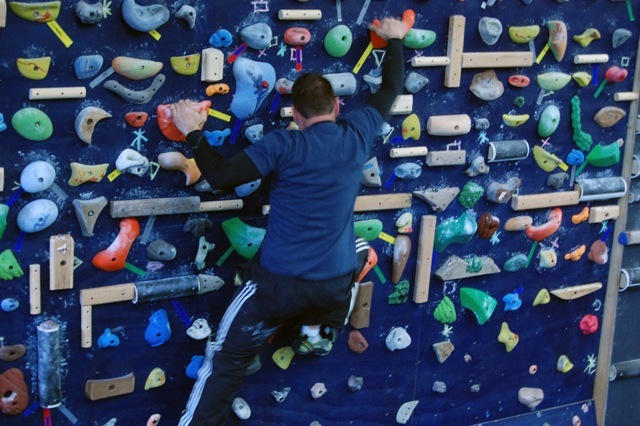 We are in the process of getting a regular climbing class on the schedule and formulate guidelines for those who want to use the wall on their own. Stay tuned and let us know if your interested. Mike seems to be catching the climbing bug. Compare HB’s to last Monday. Food for thought…….On the one hand you can indeed train without getting to a point where any significant effort is felt. But progress, assuming any is made, will of necessity be very slow. The body is not stressed enough for any significant adaptation to occur. But that may suit some trainees just fine, if their ambitions are modest. On the other, if you are more ambitious, you will have to put in much more effort. You can call that pain or you can call it strenuous effort, but it will take some work. The rewards will also be much higher. Pain level and gain level, the choices are yours. Great success could be had if the fear of exertion could be overcome.